*This post was sponsored by the J.M. Smucker Company. 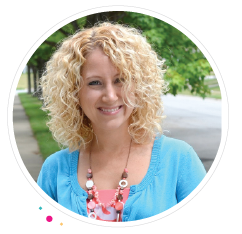 I am partnering with them this fall as a brand ambassador creating recipes from products they send me. Fall has officially made its way to the midwest. Wearing jeans and sweatshirts all the time has finally commenced. It has been cooler during the day and very chilly at night. We actually woke up to frost on the ground this morning. It is the perfect weather for snuggling under a blanket with a hot cup of coffee. My favorite drink of the fall season is a salted caramel mocha latte. Now that I can recreate the coffee shop drink though, I try to drink them all year round, but for some reason they taste the best in the fall. I think it is all mental. Chilly weather + sweatshirts = hot caramel coffee love. It’s just how my brain works. I told you last week that I had another delicious fudge recipe for you. Another thing that tends to happen more often in the fall is fudge. All the fall craft fairs and festivals have different flavors of fudge ready to go. I love going to these events just to see all the fun new flavor combos that everyone comes up with. Although I really think fudge should be more of a thing all year round, right? Those little sugary cubes of goodness shouldn’t have a fall and holiday limit to them. Let’s all unite and make fudge every month. This month Pillsbury sent me a fun box of baking supplies. As soon as I saw the caramel frosting, I knew fudge was happening. The only thing I wasn’t sure of was how to jazz it up. It didn’t take me too long to think about s’mores-itizing it. And yes, that’s my own word there. Chocolate, grahams, and marshmallows just make everything better in my mind. 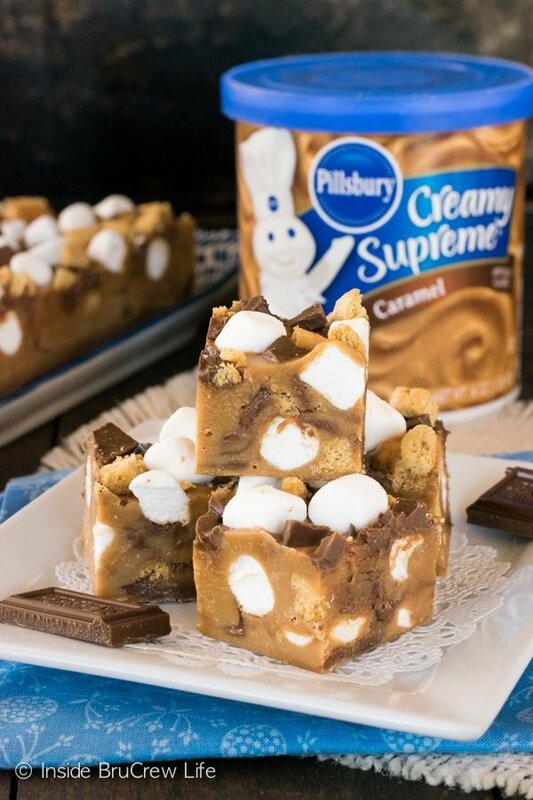 Just look at these s’mores cookie cups. 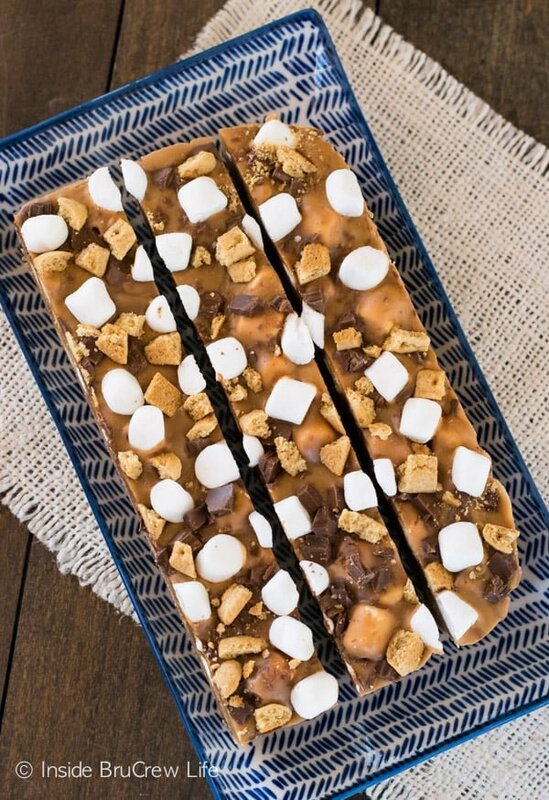 A s’mores combo is a fun way to make any treat that much better. Did you know that the Pillsbury Dough Boy just celebrated his 50th birthday? The cute, chubby icon has been doing commercials and getting his belly poked for half a century. I think a birthday like that needs to be celebrated with a big plate of fudge!!! 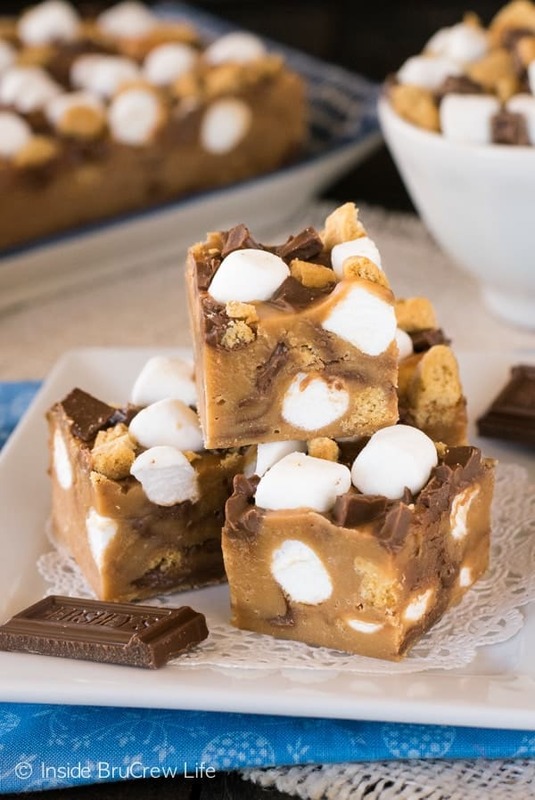 This easy caramel fudge is filled with s'mores goodness. 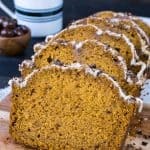 It is the perfect way to keep the summer taste alive in the fall. Place the white chips and butter in a saucepan over low to medium heat. Stir until melted and creamy. Remove the foil lid from the frosting and microwave for 30 seconds. Stir and pour over the melted chips. Stir until smooth and creamy. Remove from the stove and cool 10 minutes, stirring occasionally. 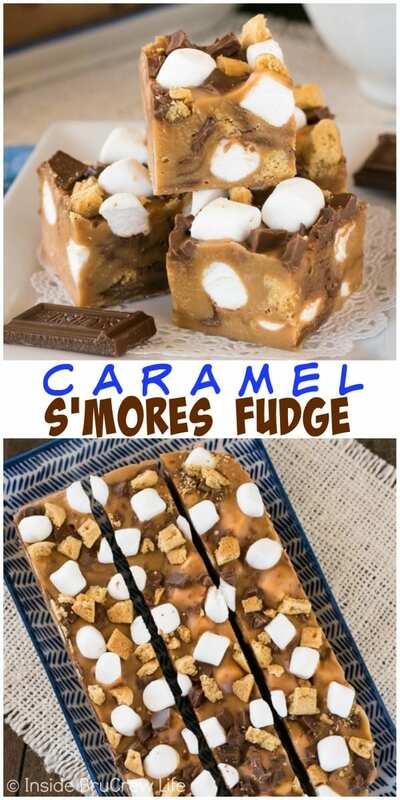 Mix together 1/2 cup marshmallows, 1/2 cup graham chunks, and 1/2 cup chocolate chunks. 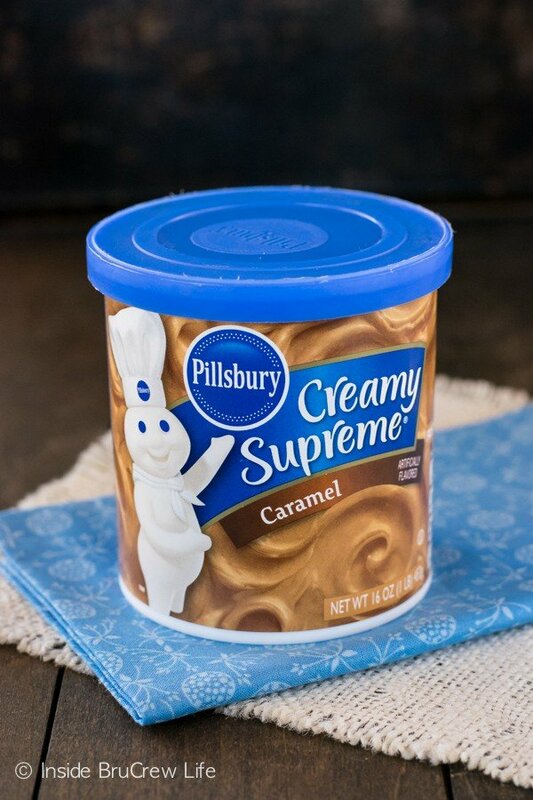 Stir into the caramel fudge mixture quickly. Pour into the prepared pan. 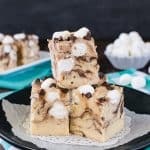 Top with the remaining marshmallows, grahams, and chocolate chunks and press in gently. Let set. Remove the foil from the pan and cut the fudge into 36 pieces. Store in a tightly sealed container. 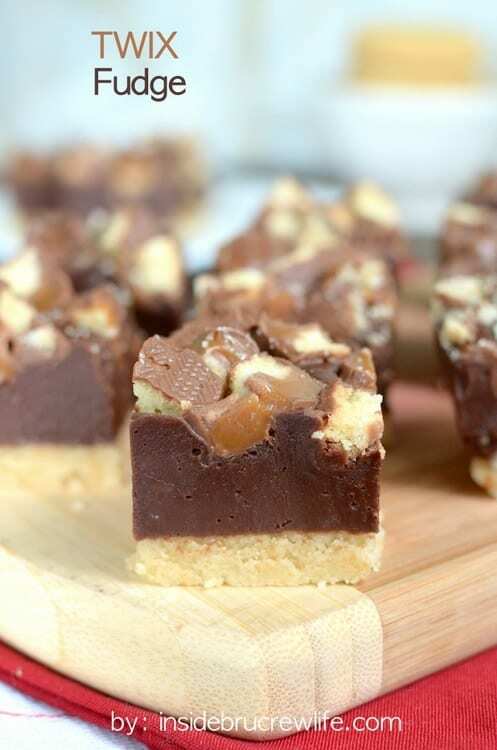 *You can also cut the fudge into 49 squares if you want smaller pieces. I have been watching for more of this frosting too!! It was the perfect way to make fudge!!! I’m glad you liked it!!! Oh man, I need this in my life. I LOVE s’mores but it’s rare I get my fix in the winter. This is so perfect for Christmas baking trays! 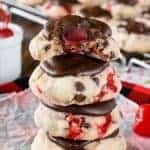 This would be such a fun treat for the holiday trays this year!!! Looks wonderful, Jocelyn! I think I need to try making this! 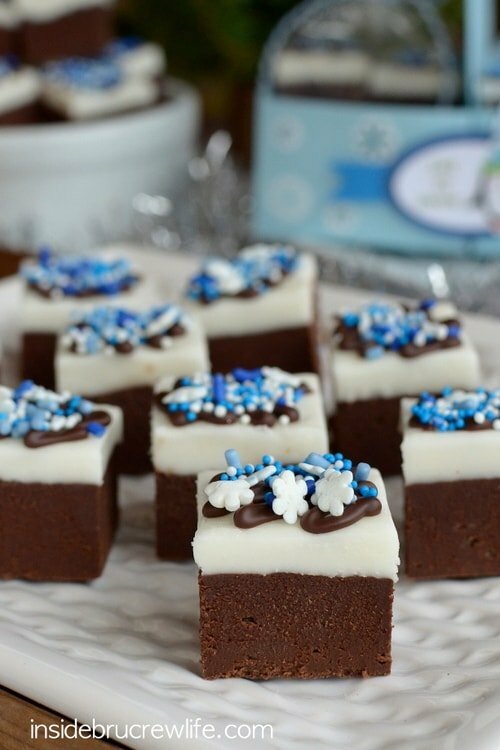 Who wouldn’t like a batch of this fudge for the holidays! Looks amazing. I think this is the best fudge I’ve ever had!! The only thing missing the night I was eating it was you. 🙂 It was great hugging you last week!! Girl, I am so glad I got to hug you!!! I’m bummed we didn’t get to hang out more! Once I’m settled and not stressed it needs to happen!!! I’m glad you liked the fudge!!! Brilliant way to get that caramel frosting in there, Jocelyn! This looks incredible. And it really is getting cold, so this is even better fudge for sweater weather! This fudge is calling my name! 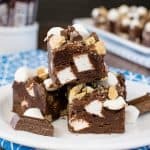 I just recently learned how to make fudge from prepared frosting and it is a total game-changer for me! 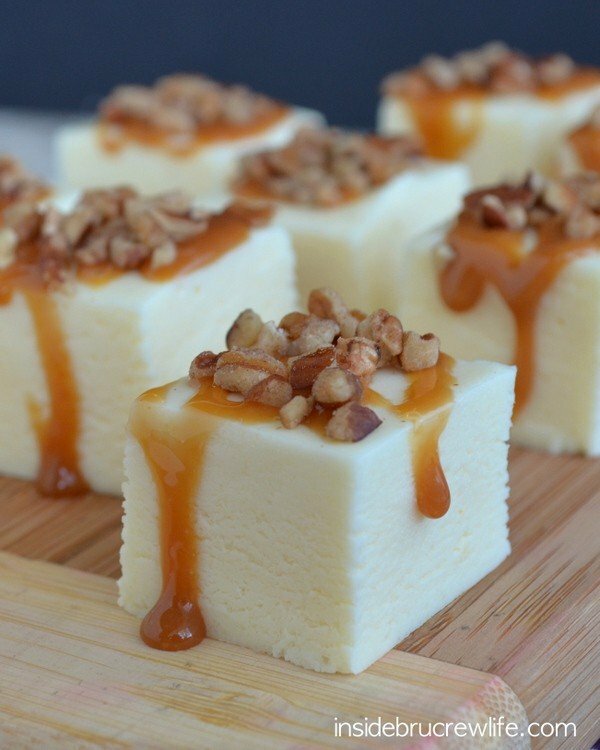 It’s the quickest and easiest fudge ever! 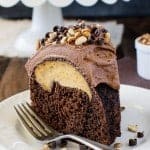 Such a versatile recipe to use any flavor of frosting too. 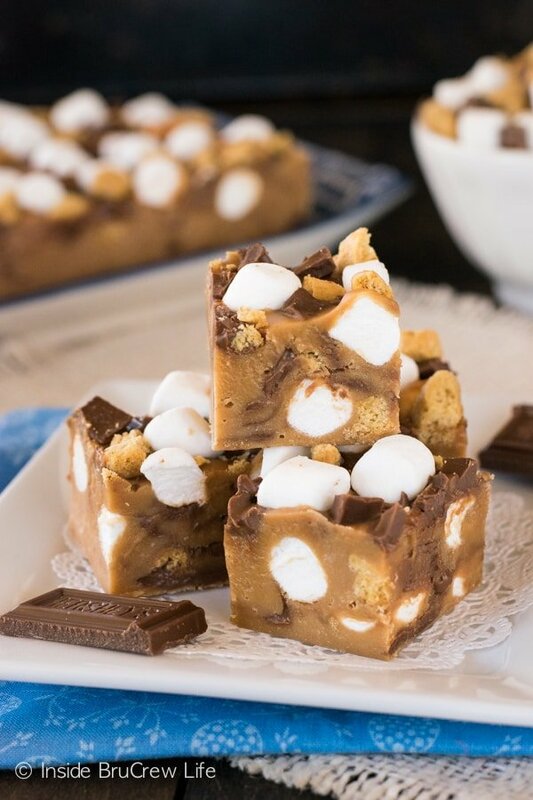 I love how you combined s’mores fixings (one of my favorite desserts of all-time) with caramel! That sounds incredible! 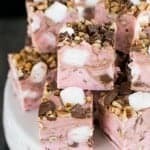 It’s one of my favorite ways to make fudge!!! Love that it sets up every single time!!! What a great flavor for fudge! 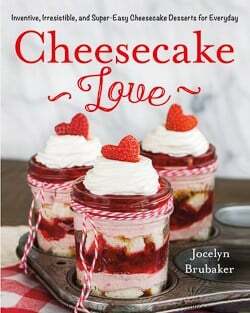 I’m going to have to add this to my holiday baking list!